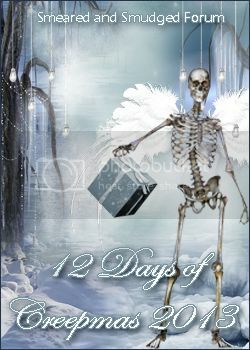 Darker side of me - Crafting Vicky: 12 days of Creepmas - Day 12 the end! This one is celebrating so was just perfect for this... but again I found him a little sentiment from Create with TLC. I colored him with my copics. I added some glossy accent to his red eyes. The papers for all my little ATC are from leftover Christmas card so that was a great way to reduce my pile! That's it for today! Hope you like it ;o) It was great fun to be part of this hop!!! So hope you have liked my creations. Your ATCs have been SO fun. What a creative take on all those Grumpies. Thank you for all your hard work! Vicky, I love this last ATC. That Grumpy is very creepy with his red eyes. Love the sentiment. Have a very Merry Christmas and a Happy New Year, my friend. 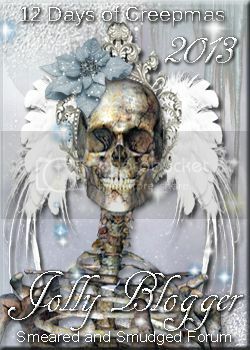 What a fun ATC...great stamp and sentiment. Looks like you grumpie has partied hardy! It's bee a fun hop! Happy Christmas Vicky, I have enjoyed visiting your blog during this hop. Love your final little grumpie, the sentiment and the grumpie's little red eyes are brilliant for creepmas. Hi Vicky! I have LOVED seeing your Creepmas creations. Thank you for doing this hop with all of us. Perfect sentiment to finish this off.